Tenant housing group representatives from across the Highlands have been working with The Highland Council to produce a new strategy that puts tenant involvement and communication very much at the centre of future housing service delivery and development. 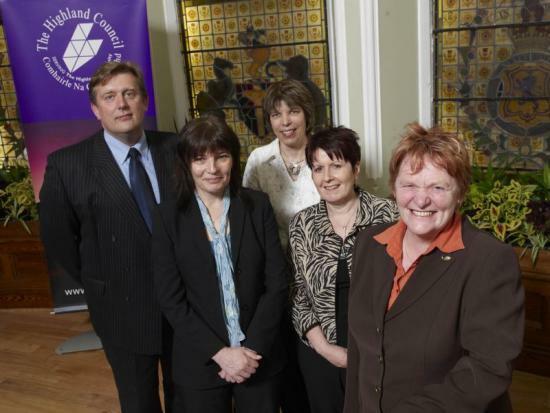 Launched on Monday 25 May 2009 the strategy replaces The Highland Council's previous strategy and, running up to 2012, it aims to improve opportunities for tenant participation across Highland and develop and maintain effective working relationships to progress the design and delivery of housing services. Central to the strategy's delivery is a new structure for participation which has been developed by tenants and involves the setting up of a Tenant Area Panel in each of the Council's 3 operational areas. In addition to this, existing tenant and resident groups will continue to be supported and new ones encouraged to develop and register as statutory Registered Tenants Organisations. In the Highlands there are currently 20 registered tenant organisations where tenants are Highland Council tenants, as well as other groups where members are tenants of Housing Associations operating in Highlands, representing a wide geographical spread. In addition to these groups, 200 individual tenants have registered their interest to be kept informed in greater detail of developments and given the opportunity to contribute to consultations. Earlier today representatives from each of these groups met up at Inverness Town House for the launch of the strategy. Welcoming the new strategy, Chairman of the Council's Housing and Social Work Committee, Councillor Margaret Davidson said: "Working with tenants and staff to develop this Tenant Participation Strategy for Highland has been a process full of energy and commitment. This strategy reflects what we want to achieve and how we hope to deliver change over the next three years as we implement the revised Strategy and Action Plan. It offers people the chance to contribute in different ways, by committee or by just keeping in touch and offering ideas on how to improve the quality and direction of services. I would like to congratulate and thank everyone involved in developing the strategy and look forward to continuing to work with them to put it into practice." Jennifer Macleod, of Firhill and West Alness Residents Association has played an active role in the Tenant Review Group. She said: "Tenants have learned much as a group, and as individuals, from actively taking part and making our views known in developing this strategy. We look forward to working more closely with more tenants over the next three years, and with staff of Highland Council, as we work through the actions we've agreed. We hope more tenants will be encouraged to join us!"